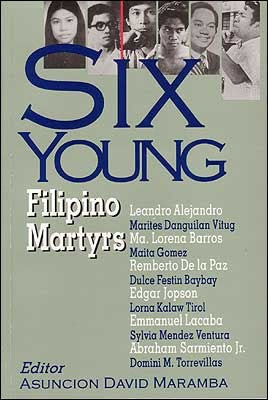 I highly recommend this book if you want to know more about the Marcos regime/ Martial Law: SIX YOUNG FILIPINO MARTYRS (1997, 300 pages, Anvil Publishing) edited by Asuncion David Maramba. It includes 6 biographies of Leandro "Lean" Alejandro (written by Marites Danguilan Vitug), Ma. Lorena Barros (written by Maita Gomez), Remberto "Bobby" de la Paz (written by Dulce Festin Baybay), Edgar "Edjop" Jopson (written by Lorna Kalaw Tirol), Emmanuel "Eman" Lacaba (written by Sylvia Mendez Ventura), and Abraham "Ditto" Sarmiento Jr. (written by Domini Torrevillas). A young batch indeed but never too young. They were young: too young to die, too young to carry the complacency of a slumbering people, too young to suffer tyrants. They were brutally killed and tormented by Ferdinand E. Marcos, Jr.'s men. I read this book in 1997 as a Junior in College (De La Salle University in Manila), not as a reading requirement for school. I bought this book because I wanted to know the kind of life people lived during Martial Law. I shed tears in every page, literally! I was reading this book while listening to the music of Yanni and Enya. Because I wanted to feel how these 6 young martyrs suffered, and suffered beyond control, beyond tolerance, beyond pain. I could never imagine myself bearing their kind of affliction, ordeal and misery. It was just too difficult to carry.